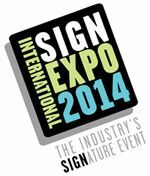 The ISA International Sign Expo 2014 is set for what’s expected to be record-breaking attendance April 23-26 in Orlando. More than 17,000 sign industry professionals and 500 exhibitors are expected in Orlando– and there will be quite a bit of digital signage activity. The Dynamic Digital Park area on the Expo floor– dedicated to digital signage exhibitors and launched at last year’s ISA Expo, will be a particularly good place to engage with sign companies that have relationships with end-users nationwide– end users that are looking for digital signage solutions. Thursday, April 24, 9:30 a.m. – 5:00 p.m.
Friday, April 25, 9:30 a.m. – 5:00 p.m.